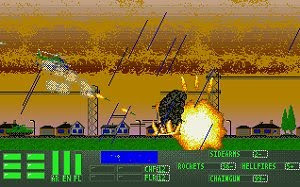 Tiger's Bane is a free hybrid of the shoot-em-up and simulation genres, combining side scrolling action with realistic elements such as limited ammunition, accurate modeling of weapons and their effects, flight dynamics that take inertia and wind into consideration, and a wide array of real battlefield machinery to fly, destroy, and protect. In Tiger's Bane you take on the role of air cavalry commander against a growing world terrorist threat. You have full control over which helicopters you and your wingmen (up to 2) will fly, including the Apache, Comanche, and Super Cobra Gunships, and the Blackhawk transport helicopter. You can also call on support from F-16 and A-10 attack planes from the fighter squadron. The more than 80 missions take place in various locales, including large cities, island chains, and blistering deserts. Random weather effects such as rain, wind, fog, and thunderstorms are modeled, in addition to variable time of day. For night missions your helicopters are equipped with infra-red night vision systems.